Piscataquis County, central Maine, U.S. It comprises a largely mountainous region drained by the Piscataquis, Pleasant, and Penobscot (west branch) rivers. Moosehead Lake (120 square miles [310 square km]), one of the hundreds of lakes and ponds in the county, is the state's largest lake. Others are Chesuncook, Chamberlain, and Pemadumcook lakes. Mount Katahdin, located in Baxter State Park, rises to Baxter Peak (5,269 feet [1,606 metres]), the highest point in the state and the northern terminus of the 2,100-mile (3,400-km) Appalachian National Scenic Trail. 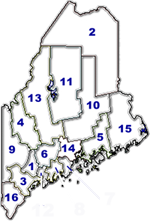 Other public lands are Lily Bay and Peaks-Kenny state parks, Gero Island, and the Allagash Wilderness Waterway. Major forest types are spruce and fir, with stands of aspen, maple, and birch. The county was formed in 1838; its name was derived from an Abnaki Indian word meaning "at the river branch." The county seat, Dover-Foxcroft, is the largest town. Other towns include Milo, Greenville, Guilford, and Brownville Junction. The Katahdin Iron Works, in use from 1843 until 1890, took advantage of the region's raw minerals. Principal industries are tourism and the manufacture of textiles and wood products. Area 3,966 square miles (10,273 square km). Pop. (1990) 18,653; (1996 est.) 18,329.